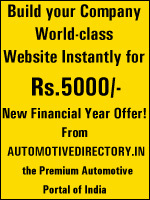 Automotivedirectory.in is a leading e-market for Indian manufacturers and worldwide automotive community. We are constantly promoting our portal in over 120 countries around the world and we are also successfully positioning our portal on major search engines like google, yahoo, msn, altavista, metacrawler etc.., to expand our registered users business. Become our members today to win everyday! Members can subscribe to an exclusive email alert that informs members of the latest postings and opportunities in the product categories of their choice. Members can access the International buyer list. Find out and get contact with potential buyers of your products. Customized advertisement area for manufacturers to expose the products. Turn your stock into cash now! Registered your complete company details with product / service description, contact person information, e-mail and website for effective business promotion. Free links to your existing company website and free Biz page on Automotivedirectory.in for easy access to buyers. Access to all Automotivedirectory.in services.